Over the last twenty-four years of being a business owner, I have always been proud of my staff’s skills and the evident passion it showed for the company and its customers. But I was struggling with how to implement their skills properly to rise to the level of success I knew they could achieve. I felt the team was misaligned with respect to job responsibilities, resulting in forced and unreal expectations on each teammate. Among mounting frustration, I was introduced to Kolbe as a way to harness employees’ natural instincts for better job performance and satisfaction. The discovery led the management team of my firm to begin a process of identifying each team member’s natural instincts so that it could rework the company’s organizational chart with the goal of giving each team member the freedom to act naturally in his/her position day in and day out. The results were startling. Efficiency was at an all-time high, resulting in higher sales with less payroll expense. Additionally, we saw the equity in our business increase five times since reorganizing. At the end of the day, there have been many, many things that have impacted my business lenses over the years, but utilizing Kolbe to put the right people in the right position - and harnessing their natural, instincts - has been the most impactful and meaningful tool. 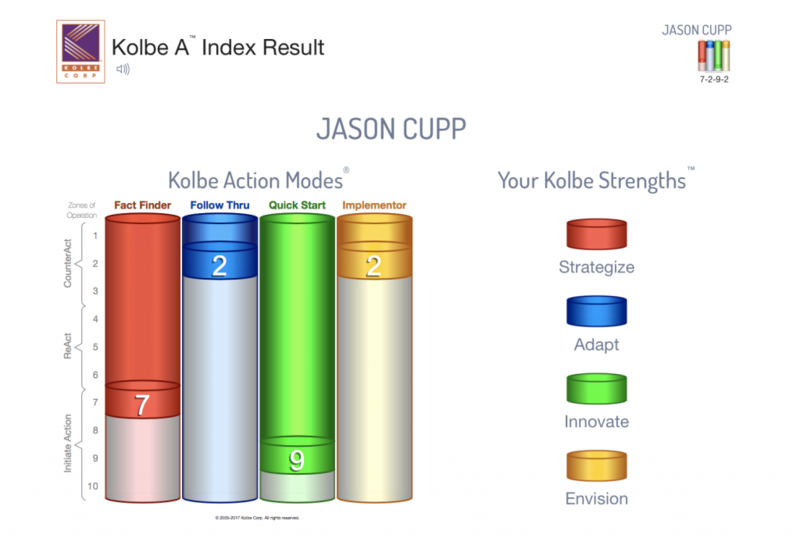 Now, it might make sense why Kolbe is the backbone of the relationship we have with our consulting clients, and the way I focus a majority of my time. To learn more about Kolbe, click contact me. To read about an award that I won recently for my work with Kolbe Wisdom, click here.